LONDON (AP) — The U.K. and the European Union plowed ahead Monday with plans to have their divorce deal signed, sealed and delivered within days as British Prime Minister Theresa May waited to see whether rebel lawmakers opposed to the agreement had the numbers to challenge her leadership. May said “an intense week of negotiations” lay ahead to finalize the framework. The deal has infuriated pro-Brexit lawmakers in May’s Conservative Party. The Brexiteers want a clean break with the bloc and argue that the close trade ties called for in the agreement May’s government agreed would leave Britain a vassal state, bound to EU rules it has no say in making. The European Union's chief Brexit negotiator says that a draft deal on Britain's exit from the bloc was "fair and balanced," adding that it allowed for an orderly withdrawal. Even if May sees off such a challenge, she still has to get the deal approved by Parliament. Her Conservatives don’t have a parliamentary majority, and whether she can persuade enough lawmakers to back the agreement is uncertain. It is also unclear what would happen if Parliament rejected the deal when it is put to a vote, likely next month. May’s government relies for survival on the votes of Northern Ireland’s Democratic Unionist Party, which struck a deal last year to back the Conservatives on major legislation, including finance bills. But the DUP opposes the Brexit deal’s plans for keeping the border between the U.K.’s Northern Ireland and EU member Ireland open after Britain leaves the bloc. In a warning to May, DUP lawmakers abstained Monday during several votes on the government’s finance bill. May argues that abandoning the plan, with Britain’s March 29 departure date just over four months away, could lead to Brexit being delayed or abandoned, or to a disorderly and economically damaging “no deal” Brexit. But opposition Labour Party leader Jeremy Corbyn said his lawmakers would vote against May’s agreement and also try to block a “no-deal” exit. “There is no better one for this crazy Brexit,” Asselborn said as EU foreign ministers met in Brussels before the Sunday summit of member country leaders at which the bloc intends to sign off on the deal. Most contentious negotiating issues have been resolved, but Spain insisted at the Brussels meeting that it needed more clarity on how Gibraltar, the British territory at the southern tip of the Iberian peninsula, would be dealt with. 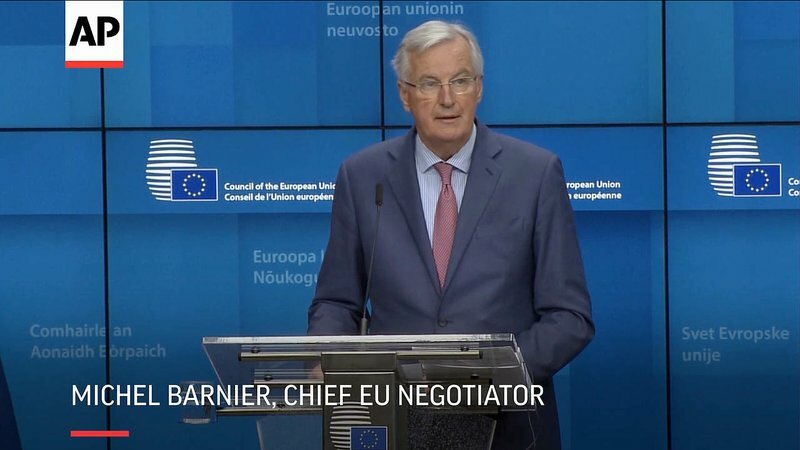 EU chief negotiator Michel Barnier said the EU foreign ministers “have agreed to the principle” of a one-off extension of the post-Brexit transition period if the two sides need more time to finalize a trade deal. Under the divorce agreement, Britain would be bound by EU rules during the transition. It is due to end in December 2020 but can be extended by mutual agreement if more time is needed. May tried to build public and business support for the deal on Monday, telling business lobby group the Confederation of British Industry that it “fulfills the wishes of the British people” to leave the EU, by taking back control of the U.K.’s laws, money and borders. She said EU nationals would no longer be able to “jump the queue ahead of engineers from Sydney or software developers from Delhi” — a phrase that risked further upsetting EU citizens in Britain, who have faced more than two years of uncertainty about their future status. British businesses, longing for an end to uncertainty about what rules they will face after Brexit, have broadly welcomed the agreement. But some are unhappy with the immigration plans, which have yet to be revealed in detail. Carolyn Fairbairn of the Confederation of British Industry urged the government not to make “a false choice between high- and low-skilled workers” that would leave many sectors short-staffed. “And let no one be in any doubt - I am determined to deliver it,” she said. In Brussels, Austria’s minister for Europe, Gernot Bluemel, struck a more melancholy tone.